Who hasn’t dreamed of giving the rat race up to live on a sunny island? Well, now you can do just that – as long as you like cats. A lot. 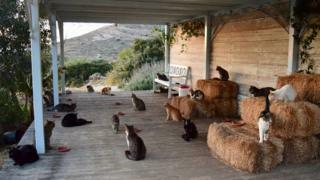 A job at a cat sanctuary on the idyllic Greek island of Syros has come up, complete with accommodation, views of the Aegean Sea and – currently – 55 feline friends. Somewhat unsurprisingly, the advert has garnered a lot of interest since it was first posted on Facebook earlier this month. So far, it has been shared 20,000 times, and some 200 people have emailed sanctuary owner Joan Bowell expressing their interest. Of course, not everyone is going to be a good fit for God’s Little People Cat Rescue. Ms Bowell, an artist, is looking for someone over the age of 45, who is not only capable of loving the cats, but also knows how to “trap or handle a feral or non-sociable cat”. That means knowledge of “cats’ psychology” as well as good “cat-whispering skills” are vital for the successful applicant. But if life on a Greek island isn’t quite floating your boat, there are a few other dream jobs around at the moment. You could be a Nutella taster in Italy – previous experience not necessary – or a warden on a picturesque Welsh island (as long as you can speak Welsh). But beware: sometimes things may not turn out quite they way you thought they would. Ben Southall beat thousands to the “best job on the planet” – becoming caretaker of Australia’s Hamilton Island, back in 2009.